Argus is a 16-pixel W-band focal plane array for millimeter spectroscopy that has been deployed on the Green Bank Telescope (GBT). The array is designed to operate in the 85-116 GHz range (Sieth et al. 2014, SPIE 9153; doi:10.1117/12.2055655 (pdf)). Argus is a collaboration between Stanford U. (PI Sarah Church), Caltech, JPL, Univ. Maryland, Univ. Miami, and the Green Bank Observatory (GBO). 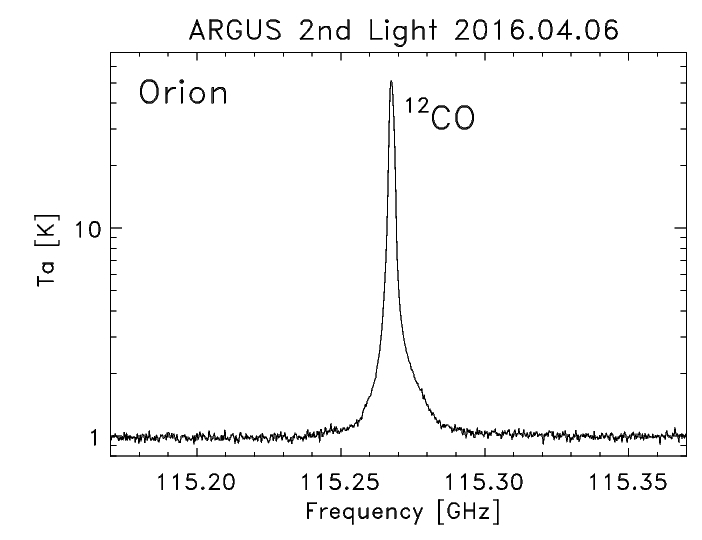 Figure: The test map of 13CO in DR21 shown at the right was taken with an opacity of 0.42 (marginal conditions) in about 40 minutes of mapping using all 16 beams of Argus. The map is the result of the default data processing without any data editing. The small beam of the GBT is shown in white to the lower-right of the image for comparison. Note: Beam2 and Beam3 are for the instrument beam numbering system (1-16). This corresponding to fdnum1 and fdnum2 using GBTIDL numbering system (0-15). 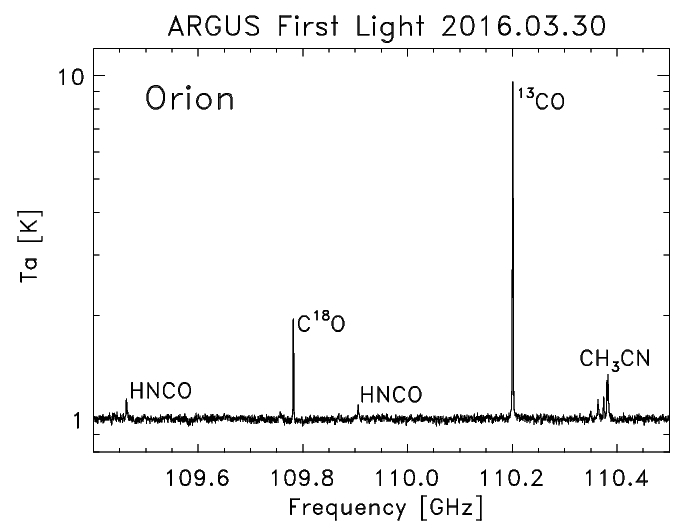 Argus has successfully completed its commissioning and has been carrying out science observations on the GBT since 2017. The normal DSS scheduling system applies, and priority for observations will be given to teams that visit Green Bank to carry out the observations. Example Argus observing scripts are located at: /home/astro-util/projects/Argus/OBS while example Argus GBTIDL reduction scripts are located at: /home/astro-util/projects/Argus/PRO. The information contained here will expand significantly as it becomes available, but the details related to observing can wait until you visit Green Bank for observations. GBT Training Workshop Web page (includes some useful general information for non-experienced GBT observers). ARGUS is a "shared-risk"/PI-instrument for the GBT (GBT Proposal Page). Argus shared risk policy: [pdf file]. Proposers must contact the instrument team for permission to use the instrument; email address: "argus_at_gbt@stanford.edu"
4x4 element focal plane array with beam separation of 30.4 arcsec on the sky in both the elevation and cross-elevation directions. Users can observe multiple lines simultaneously using VEGAS sub-banding modes (http://www.gb.nrao.edu/vegas/). Double-side-band instrument with IQ-mixer scheme to separate the USB and LSB. The user can select one of the side-bands to connect with VEGAS. Sideband isolation is about 10-20 dB. Instructions estimating the observing time needed for Argus using the GBT sensitivity and mapping calculators (example of time estimation). Figures: (Noise Temperature as a function of frequency measured for Argus during good weather conditions during a maintenance day (zenith tau(90GHz)=0.057). The small "+" are individual Tsys measurements for each of the 16 beams, where Tsys corresponds to the total system temperature applicable for Ta. The median over all the beams of these values is shown by the squares. The median of the effective Tsys* corresponding to the system temperature associated with the measured Ta* is shown by the triangles, while the median values for the implied receiver noise temperature is shown by the diamonds. 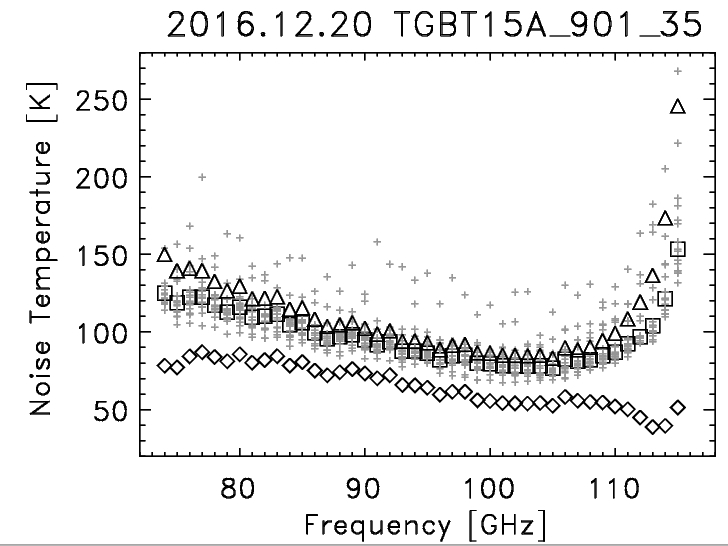 The First and 2nd Light spectra are the first time the GBT has observed above 100 GHz. VEGAS is the new GBT spectrometer and supports several modes. Here we show the VEGAS bandpass performance as a function of bandwidth/mode for Argus. The bandpass shapes shown here are similar to those seen with other GBT receivers. The narrow-bandwidth modes (11-24 MHz) have a smoother bandpass and are good for frequency switching, while the larger bandwidth modes (100-1500 MHz) show signficant ripples/structure across the bandpass. 1 1500 +/-650 15-40 MHz structures Fig. 3 1080 +/-400 44 MHz ripple Fig. 4 187.5 +/-80 12.5 MHz ripple Fig. 7 100 +/-45 6.7 MHz ripple Fig. 10 23.44 +/-9.5 smooth passband Fig. 15 11.72 +/-5 smooth passband Fig. 20 23.44 +/-9.5 small bump in middle Fig. 25 16.9 +/-7 small bump in middle Fig. This is the public Argus web page. Users can contact David Frayer with questions about observing. Argus team members should contact David Frayer for the location of the team web page(s) with more detailed information.